For my last blog, I will change the topic to something more light hearted and more of a “fun fact” post. I was talking to one of my colleague workers at my internship asking for a “fun” non-internship related topic but ofcourse within the boundaries of biochemistry and biology. He came up with (in my opinion) quite interesting topic: Cultured meat in petridishes. Basically this means we can grow burgers and meat in the lab. Yes, I know the idea sounds a little bit distasteful but in the article they explain the petridish burger compares pretty good to a normal “burger”. It only needed some extra seasoning. The reason behind this research is the upcoming shortage of beef and meat in general for the always increasing population of mankind. So this would decrease the need for cattle but also lower greenhouse gas emmissions. The only downside at the moment is the cost. I think I read somewhere this one burger costed around 300 000 dollar to make, while still optimizing the protocol and the price will sure drop per burger, it still might be extremely expensive to make one. So what do you guys think? Could this be the solution for vegetariens and cattle? Anyways, Bon Appetit! My question is whether the nutritional value of this kind of meat as well as the original one, if the nutritional value has no losses, the taste is also the same with the actual meat that I can accept this kind of meat which grow in the labor. Yeah it’s mentioned the appropriate amounts of fat and other substances are not the same yet as in real meat and its primarly just protein but indeed it would be a huge step forward if they would match the same nutrional value or even higher value. I think I would become a vegitarian, I like meat but I’m not sure I want to go that far for meat. What do you mean with going so far? If made right, it’s probably healthier than normal meat with less resources? I do not know if it is worth all the energy and money. If you look at the genetically manipulated patatoes, everyone has his own idea about it. Yes it would be good if it would be more resistant against different weather situations. But on the negative side it would be again the smart people who would benefit the most of it. 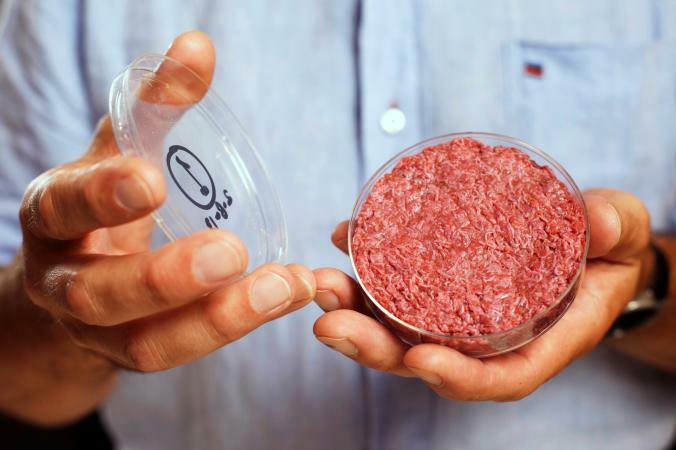 I think it will be a great succes if the nutrional values of this genetically modified meat will meat its nature one and if the prices are drastically lowered. However, I think that it also create a lot of problems. The CO2-emmisions will raise due to the production of this kind of meat. We also need some ingredients (for the media in order to grow the cells) for the production of this meat and might progress the exhaustion of the ground on our planet. A side note has also to be made that almost every kind of food that is currently on the market is somehow a bit genetically modified. This fact should not be a struggle for the society.